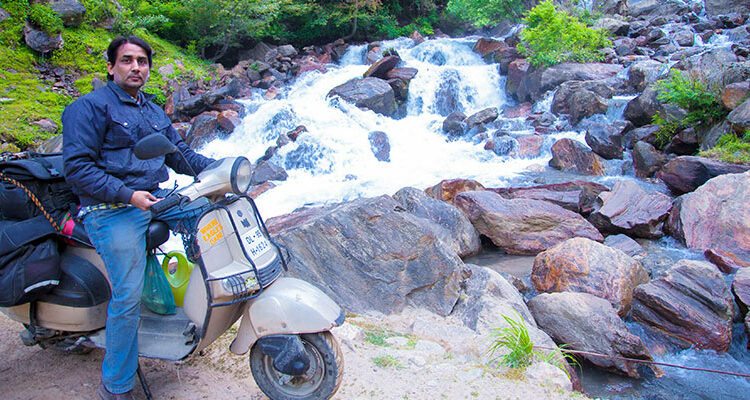 This is a recount of my 2016 roller-coaster ride through the picturesque Kishtwar-Gulabgarh-Ishtiyari and Pangi valley, a ride full of ups and downs, painful moments, meeting and spending nights with strangers, falling off my scooter, riding through the breathtaking cliffhanger road, resolving mechanical failures of the scooter, a ride full of friendly warmth and helped by friends in times of crisis. (By Narender Kr. Gautam) On 10th May, schools closed down for the summer vacations and I got busy with planning a trip to the land of the high passes with Pankaj, a fellow BCMTian from Gurgaon. We were set for the departure on 1st June and since I wanted to experience camping this time, I equipped myself with a solar charger, tent and a sleeping bag. My scooter has a puny 5.5L fuel tank and every-time on refuelling, I had to untie all the bags in order to open the seat. So one hot afternoon, I cut my scooter seat in half, dismounted the no longer required cut out pieces and got my tailor seal the exposed sponge of the seat. The job was decent but it effectively did away with the problem during refuelling. (DAY 1: Delhi – Ludhiana) At 5 in the morning with a silent prayer on my lips, I kissed my sleeping children goodbye for the next two weeks and kick started my journey to meet Pankaj at Dhaula Kuan. Once he arrived, we shifted a few heavy items on to his bike and had tasty alloo-paranthas that he got packed. We started our ride, sweating profusely through the hot summer morning. The game had just begun! Target for day 1 was to reach Ludhiana and spend time with traveller friends there. Taking a detour through Zirakpur, we finally reached Ludhiana in the evening to be warmly welcomed by DS Dhillon paaji at his residence. With DS Dhillon at Ludhiana. Soon after, a lot of Ludhiana friends assembled and we decided to have the farewell dinner together at the famous Hotel Baba Chicken. It was a great and memorable evening. I felt indebted to have their blessings for our trip. 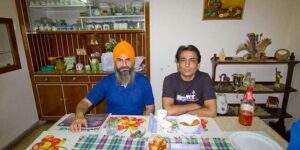 We went to Dhillon paaji’s house thereafter and had a comfortable night of sleep, erasing all the tiredness of a hot day of riding. (DAY 2-3: Ludhiana- Udhampur) The hospitality shown by my Ludhiana friends was overwhelming. Dhillon paaji prepared stuffed poori breakfast and we took leave for our onward journey to Udhampur. Heat was unbearable in these parts with the lemon-soda vendors becoming our favourite stoppage points. We also witnessed a few forest fires from the road. Our speed was slow and we somehow reached Udhampur by night and marked an end to day two by checking-in to Hotel Praveen and hogging some chilled beer with roasted chicken. 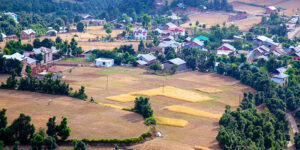 Day 3: It was the most important day for us since we had to reach Gulabgarh that day and I wasn’t aware of the road and travel conditions there, since I had never been to Doda, Kishtwar and beyond. We left Srinagar highway at Batote and turned right into the very crowded market, and somehow navigated out of the city and enjoyed the ride along the gushing Chenab river. Fun had just begun! Around noon, we reached the diversion point at Doda pul. After asking for directions to Doda, we had a prolonged lunch break. We reached Kishtwar which was 60-70 kms ahead by evening. The first thing we did on reaching Kishtwar was securing petrol supply for the next 2 days. The section beyond Kishtwar was remote. The wilderness setting in made the entire evening ride both interesting and adventurous. Within 2-3 hours since we left Kishtwar, we started encountering nomadic shepherds with their livestock. Night engulfed the landscape very soon and all we could see was the star studded sky and the nomadic camp-fires. Gulabgarh was still far. Suddenly out of the blue, my scooter’s gear wires snapped. We were stranded in total darkness…with a busted scooter. I asked Pankaj to keep his bike’s headlight focused on my scooter while I opened the front panels. 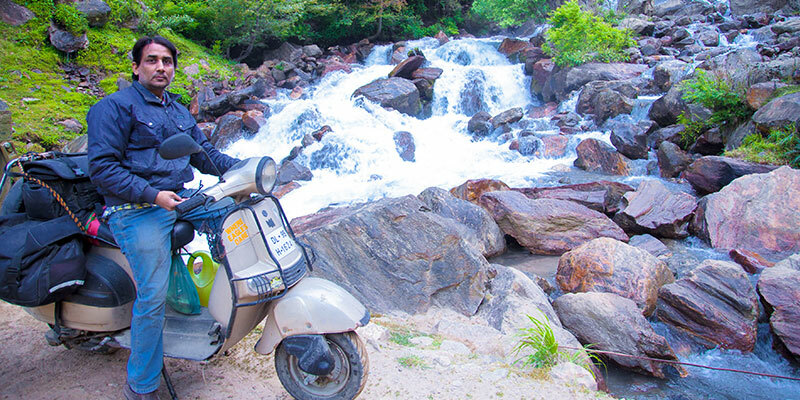 With great difficulty, Pankaj found a workable solution and we resumed our ride to reach Gulabgarh thereafter. We stopped at a small dark dhaba which was full of localites enjoying their evening drink. We asked the owner for rooms and he showed us a basic room for 150 bucks for the night. I agreed and food was served at 50 bucks per plate. After the dinner, we retired to our dingy, dimly lit room at the distant town of Gulabgarh of Kishtwar district, J&K. (Day 4) The Gulabgarh night stay at a kutcha dimly lit room was an altogether a different experience for me. The place is a mixture of hindu and buddhist population. When we woke up the next morning, we saw a Buddhist monastery in front of our dhaba. Today we shall cross the famous cliffhanger section of this route. This is what I came for! 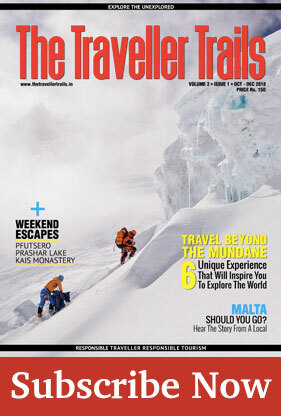 The Cliffhanger road connects J&K to Himachal and remains open in the winters too, providing a life saving link for the people of the Pangi valley in Himachal. 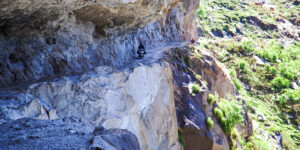 Cliffhanger section of the route. We started our journey towards Ishtiyari village and the relatively good roads turned to be offroad. It was very cold with the silent river deep below giving us company. Soon we reached Ishtiyari village and we had our first tea of the morning. We resumed our ride and reached the famous cliffhanger section of rock-cut road and had a prolonged shoot there. A few kilometres down the line by noon, we came upon a small waterfall forming a small pond upon the road. The water was green and pure… and oh so refreshingly cold! The waterfall infused new energy into us for the tough road ahead. 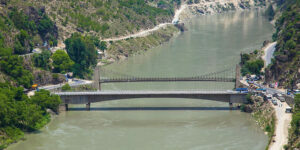 Soon we reached the Sansari bridge – the border between J&K and Himachal. Pangi valley awaited us beyond that bridge. The cops at Sansari checkpost checked us thoroughly. We inquired about any dhaba en-route, as we were very hungry since morning. We were told, “no dhaba till Killar.” The cops at the post offered us food and we had lunch in the mess, courtesy HP Police. We neared Killar by 3 in the noon, when we were stopped by BRO workers as a landslide had blocked the road ahead. Clearing work was going on. A large rock was creating the problem. As the dozers were unable to move the big rock, the BRO workers had planned a dynamite blast. All were asked to be at least 1-2 kms away from the blasting site. It took them 3-4 hours for clearing the site post-blasting. A HRTC bus was also held up at the landslide site and a sick woman had to be carried across the landslide to a cab waiting at the other side. The people of Pangi lead a very tough life! Finally at around 6 PM, we reached Killar and settled into Hotel Chamunda for a paltry rent of Rs. 400. The restaurant of the hotel was filled with local people who were boozing big time, the ambience was fully charged. We had an early dinner at the adjacent shop, thus marking an end to an extremely bumpy day of riding. (Day 5) Next morning, we left Killar at around 7 AM and started our journey for Keylong via Udaipur. The road was rough with lots of dust and sandy pits. 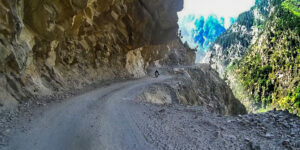 The bumpy ride was one of the main highlights of Pangi valley for riders. But riding through the desolate valley invoked an extremely satisfying and high feeling within me. The stillness of the peaceful valley was relaxing. The morning was cold, but we could find no tea shops. Absence of food joints along the route was annoying and the hunger was starting to take a toll on our stamina and made us feel extremely tired. To add to our woes, a strange noise started coming from the rear wheel of my scooter. On inspecting, I found nothing loose or broken and kept riding. We were about to reach Udaipur, when the scooter suddenly gave away and stopped. The entire rear wheel came off due to a broken stud. Luckily, it happened on a safe wide road. I asked Pankaj to proceed to Udaipur which was just a few kilometres to get a pick-up. He came back with a pick-up truck and the driver charged me Rs.5000/- for towing the scooter till Keylong. We went to a few repair shops, but none had the rear wheel drum. Mechanics told me that there were very few scooters in Keylong, so no shops had good stock of scooter’s spare parts. 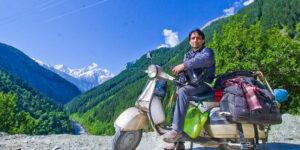 They advised me to get a new drum from Manali or Kullu. This was going to be a long nightmarish experience and testing time for me. 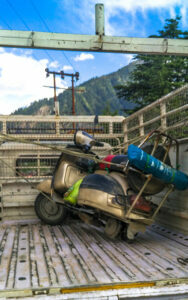 I had to fetch a wheel drum from Manali or Kullu which would at least take 1-2 days at the least. I sent SOS to all my friends in the travelling community. Finally after a few calls and some effort, Top Singh ji managed to find a new wheel drum in Kullu and sent it to my hotel through a cab which was bound for Keylong. My friends – Sameer Vaidya, a resident of Mandi and DK Pundit from Delhi put great efforts in coordinating and finding the spare part. Rashpal Singh Khalsa, who runs a bike repair shop in Manali also found a wheel drum and tried sending it to me by bus. But I told him that I had arranged for the same. This overwhelming response and helping gesture by everyone moved me beyond words. On 6th June, after getting delivery of the wheel drum at my hotel room by 7 PM, I hurried to the mechanic shop and got it fitted quickly before he closed shop. My scooter was ready for the road again bringing an end to lots of bitter-sweet experience.